We all love having a stroke and a cuddle with our furry family as it helps us to bond and can be very therapeutic, but we should all get to know our dogs a little better by really feeling what is going on under their coat. Regular examination of our dogs is a great way to teach our dogs to be comfortable with us touching their paws or looking in their ears, eyes and mouth. It also means that you are able to feel for lumps, bumps, scratches, thorns or grass seeds, and even ticks and fleas….heaven forbid! Your vet will thank you for it too. But we can go further still. Getting ‘hands on’ with your dog on a regular basis can be a great tool in helping to identify when something changes. A dog’s skeleton is not all that dissimilar from our own. Take a look at the two images above and you can see that many of the bones, and therefore muscles, are the same. One interesting difference is that humans have a collarbone that attaches the shoulder to the breastbone. In dogs, this is absent, so their forelimbs are attached by muscle alone. Whilst this gives them an advantage in movement and flexibility, the shoulder muscles are also susceptible to injury. Dogs with shoulder muscle injuries will often appear lame in front, which is identified by a definite head-bobbing action when walking. On the whole the coat and underlying skin of your dog should be fairly mobile under your touch. If you gently pinch the skin, you should be able to lift it away from the underlying muscles. Through everyday play and exercise, the tissues just below the surface of the skin can suffer micro-injury and become damaged, this is often followed by scar-tissue formation which can adhere the skin to the muscle beneath, restricting movement, reducing blood flow to the area and resulting in it feeling sore. 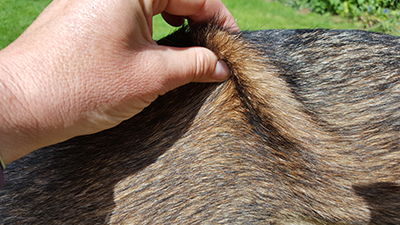 While it is fairly easy to spot a new lump or bump on a short-coated dog, those with thick, long or curly coats can disguise the facts. While non-malignant ‘fatty lumps’ are common, particularly in senior dogs it is important to ALWAYS take your dog to the vet for an examination when a new lump appears. Our 9-year-old crossbreed, Roo, is testament to that after we discovered a small swelling on her elbow last year. If it wasn’t that she disturbed a wasp nest and got stung on her front legs, we would not have necessarily spotted the lump. As it was, I felt down her leg and discovered what I thought was a simple wasp sting. When it did not go down after a few days, we took her to the vet to be told that it was almost certainly a fatty lump….it felt like a fatty lump, acted like a fatty lump…but luckily we took a sample and it turned out to be malignant. Luckily for us, she had some quite invasive surgery but is happily enjoying life once more. This is her on the beach in May 2017. Isolated areas of heat can also be a key pointer that there is inflammation present. This is a skill that can be learnt by lightly placing your hands on your dogs’ body and moving them over the coat. Feel around the neck, spine, shoulder, rump and legs. Be mindful that the muscles do warm up when the dogs are active so this is best performed when the dog has been at rest for at least an hour. The area over the lumbar spine (behind the ribcage and in front of the pelvis) can also feel warm after the dogs have eaten and this is normal. You are really feeling for differences between one side and another so if examining the front legs, feel down both and see if there is any warmth over a joint or in a particular spot. Practice makes perfect, so get to know how your dog feels. 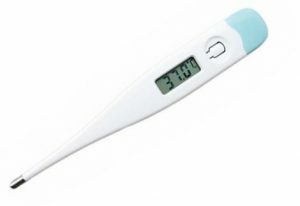 Finally it is prudent to keep a dedicated rectal thermometer in the house, and to know your dog’s resting heart rate. I find the easiest way to measure the dogs heart rate is to place 2 fingers on the top of the inside of the thigh as shown. It may take a little while to find it but once you get the location is should be felt quite strongly. Write this down somewhere so that should your dog become ill and requires veterinary intervention you are able to tell the vet what is normal for your dog. For information a dogs normal temperature is between 38 and 39.2°C (100 – 102.5°F), not the same as ours.